While the rand was still recovering from its hangover following the mid-term budget on Friday morning, it also came under pressure after Moody's rated the budget credit negative. The rand closed at R14.65 to the greenback on Friday afternoon. It averaged between R14.55 and R14.75. 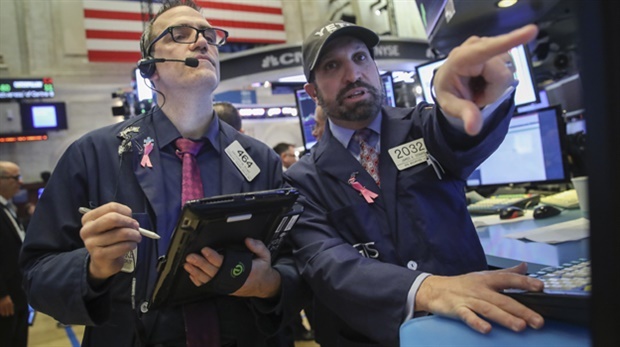 OVERVIEW: Stocks renewed their sell-off, with the S&P 500 Index approaching correction territory, as disappointing reports from technology bellwethers marred sentiment at the end of a tumultuous week. Treasuries gained and the dollar climbed to a 17-month high. Amazon.com and Alphabet led shares lower after the FAANG leaders released earning late Thursday, just minutes after helping to push the Nasdaq Composite Index up the most on a closing basis since March. The Chicago Board Options Exchange Volatility Index showed price swings the greatest since February. Investors got a brief reprise after a report showed the U.S. economy expanded at a higher-than-forecast 3.5 percent pace last quarter. “This is yet another signal that the economy is strong but not roaring,” said Mike Loewengart, vice president of investment strategy for E*Trade Financial Corp. “It’s above estimates so it should serve to calm some nerves, but within the reality of this ghoulishly volatile month it could still give investors pause. ”In Europe, the Stoxx Europe 600 Index continued its retreat, heading for the biggest monthly drop in three years. Asian shares sank deeper into a bear market earlier. Core European bonds gained and gold was on track for a three-month high as the risk-off mood spread. Markets remain on edge after more than $6.7 trillion was lost from global equities’ value since late September, as lofty expectations for earnings were tested amid heightened trade tensions and tightening financial conditions. The rand has not reacted to the release of the US Q3 GDP, TreasuryOne said in a statement. It is still hovering between much the same range as earlier. The US economy grew at 3.5% in Q3 as the country is expected to post its biggest growth in GDP in more than a decade. Growth was expected to be 3.3%. The rand was trading at R14.67 to the greenback by 14:40. The rand has continued to weaken. By 13:58, it was trading at R14.75 to the greenback. Bianca Botes, Corporate Treasury Manager at Peregrine Treasury has also commented on the rand's reaction to Moody's. In a statement she said while the rand had enjoyed a relatively good start to the day, gaining 0.4% against the US dollar, it was stumbling on the back of comments by credit ratings agency Moody's. "Moody's announced this morning that the fiscal outlook for the country is dire, and could impact negatively on the embattled economy," she said. 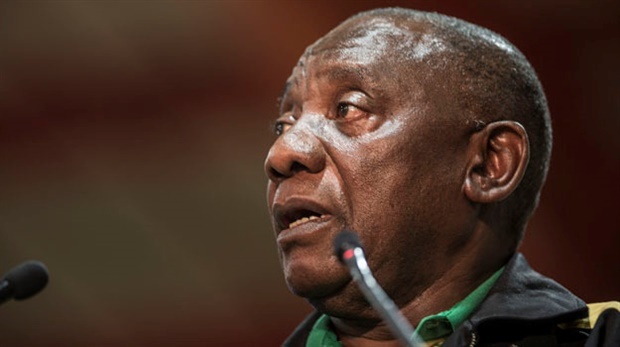 Botes said markets were keeping a close eye on President Cyril Ramaphosa as he argues the case for investment in South Africa at the inaugural Investment Conference that kicked off in Johannesburg earlier today. Rand falls to under R14.70/$. The rand had weakened to under R14.70/$ at midday on Friday. It is now 0.6% weaker on the day. This comes after Moody's Investors Service earlier announced that Mboweni's mini budget would be credit-negative. TreasuryOne told Fin24 that the rand came under "a bit of pressure" following Moody's announcement on Friday that SA's mid-term budget was rated credit-negative. "Moody's hasn't made a decision on the rating yet, so they will still have SA at investment grade with a stable outlook. There is strong possibility that they will change the outlook to negative when they do do ratings review. We will need to keep our eye on this development as well as what the USD wants to do. We have seen the USD on the front foot against most major currencies this morning, a trend we have seen the whole week. "The rest of the emerging market currencies is quite muted this morning trading rather flat, with only the ZAR a bit weaker after the Moody's comment." By 10:52, the rand was trading at R14.63 to the greenback. Earlier Moody's Investors Service said Mboweni's mini term budget had unveiled a weaker fiscal outlook, which is credit-negative. “The revenue assumptions underpinning the medium-term fiscal projections are achievable, but the broadly unchanged spending ceilings will be challenging to meet as the government aims to strike a balance between economic, social, and fiscal objectives,” the credit company said in an issuer comment on Thursday. 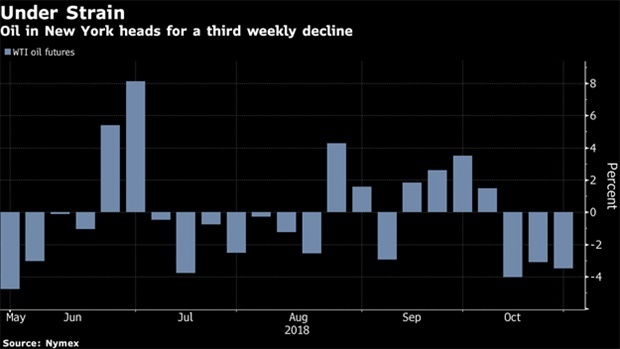 Oil is poised for the longest weekly losing streak since August as investors focus on Saudi Arabia’s pledge to ramp up production at a time of growing economic uncertainty following a global equity rout, reports Bloomberg. Big Money gliding its way into the investment summit if the shiny chauffeur-driven wheels outside the Sandton Convention Centre is anything to go by. CEO's tapping their well-shod feet as GCIS accreditation system goes into snail mode. Rand traders are pinning their hopes on some positive news from President Cyril Ramaphosa’s inaugural Investment Summit. The summit is part of Ramaphosa’s drive to attract R1.2tr of foreign investment into the country over the next five years. The President is due to address delegates this morning and various business and government leaders would throughout the day engage potential investors in key sectors such as manufacturing, agriculture and energy with several investment announcements expected to be made. Umkhulu consulting’s Adam Phillips said in his morning note that a comment from Finance Minister Tito Mboweni that South Africa might need some help from the IMF because of the low growth and high debt scenario, has placed further pressure on the rand. The rand is currently trading at R14.65 to the greenback. A move above R14.68 could open it up to weaken to R14.80, says Bianca Botes, Corporate Treasury Manager at Peregrine Treasury Solutions. Describing the currency’s bumpy ride this week, she says the rand is continuously under pressure, “especially in this strong dollar environment, with domestic elements simply one of the key factors adding stress to the local unit”. During the week the local unit came under pressure as the realities of the local economy once again set in and the cards were stacked against the rand as Mboweni presented his speech on Wednesday. VISIT Fin24’s MINI BUDGET SPECIAL to catch up. The Rand is still recovering from its hangover from the medium-term budget policy statement and looking fragile at the moment. 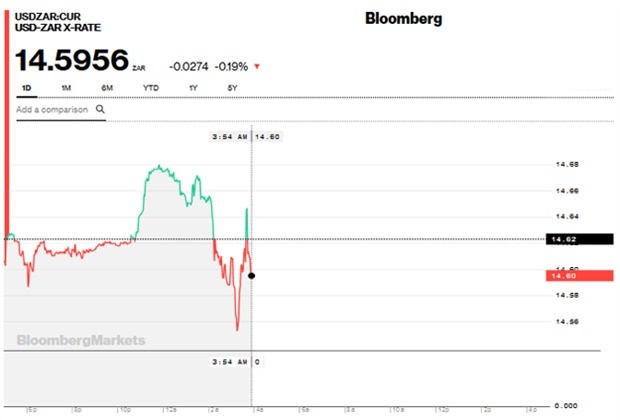 Add to that the euro/dollar rate is currently testing 1.1350 on the back of Mario Draghi’s dovishness and the US Fed vice-chair indicating that there is no stopping the Fed in hiking rates, has placed further pressure on the rand. Taking a look at the stock markets, risky assets hardly reacted to the rebound in the US stock market overnight, and we have seen the Asian stock market down this morning. The Asian markets have probably reacted to the weakening in the Chinese yuan which does not bode well for emerging markets today. We expect the rand to stay under pressure due to the falling yuan and the strength of the US dollar. The rand started on the back foot, opening at R14.62 to the US dollar and retreating almost immediately to R14.68. By 07:12 the local currency was trading at R14.65. 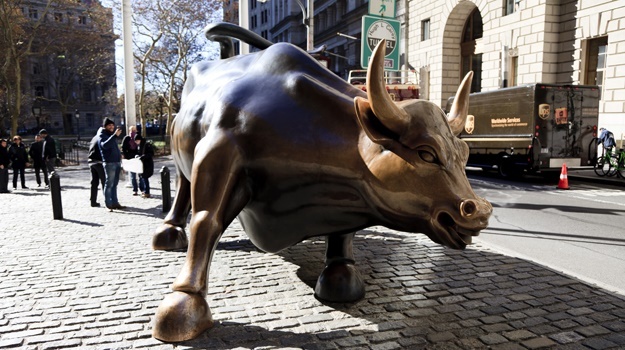 On Wall Street, the bulls came out to play, with the Nasdaq surging 3%. "We are seeing what we call a bottom fishing today," said Howard Silverblatt, senior analyst at S&P Dow Jones Indices. "After a severe sell-off its perfectly normal to see the market rebound," analyst Adam Sarhan said. "The key question: Is it a one-or two-day rally or is it a new trend?" In Asia, shares turned lower after early gains, despite the overnight jump on Wall Stree as worries over corporate earnings, trade and the outlook for growth weighed on sentiment.